I have to be better about not leaving peeps hanging.....my daughter Bianca missed quite a few days of school last week because her fever wouldn't go away and she stayed home yesterday with one. When I went to wake her up, she was sooo hot!! I wish this stupid virus would just go AWAY!! My oldest DS Reggie Jr. goes back to school on Wednesday. He's eating now and the pain from those wisdom teeth are all gone & he's all caught up with his school work thanks to his awesome tutor!! I apologize for not updating you about them......it just slips my mind and I don't want to bore you with my personal stuff. I'm off to start my day and make sure that everything's ready for technique class tonight. Thanks so much for stopping by and have a great rest of the day!! Glad to hear DS is back to normal; sorry to hear DD is not feeling well and hope she gets better soon; and your card is beautiful! It's good that you push your limit - you always come up with a beauty! That flower rocks! and the colors are fantastic! What a beautiful creation!! Love that flower!! oh thank you for such a wonderful and so lovely card you have made with my sketch, it looks so precious and brilliant. Oh my I could never be bored with your personal life and love that you keep me updated. Great card too. Beautiful job with the sketch and the colors look wonderful together! Hope all your kiddos are feeling better real soon! Gorgeous card....those colors are amazing together! Sorry to hear your kidlings have been so sick....I probably shouldn't type this because then it will be "out there", but we've been pretty lucky this year. Except for a minor bout with pink eye & a couple of colds, & one sore throat, we've been lucky!! Usually there's vomit & fevers all around, lol!!!! Take care of yourselves!! Beautiful card. I love what you've done with the sketch. Beautiful color combination and I love the flowers! Beautiful card, Jackie! Love the dimension of the flower element, especially! Beautiful card, Jackie! Glad to hear DS is doing good. I hope your daughter will be better soon. Having a fever is no fun! Hugs, Ellie. glad to hear RJ's teeth are FINALLY better and I hope that Bianca kicks the virus soon, ot's scary when your kids get those high fevers! Neat color combo. We must be on the same wavelength today. I challenged myself to use cameo coral too because it's one I rarely touch. How gorgeous - Love the flower embellishment. Beautiful, Jackie! I just love the bird image you used. Now I need the dies you used! They look gorgeous and are the perfect embellishment. very pretty. I like this color combo. Very pretty! Love the color combo and the bird. This card is very pretty you did a wonderful job on coloring the bird!!! I love the colors!!! Hope your class went well!! Love that flower and leafy branch! This card is beautiful! 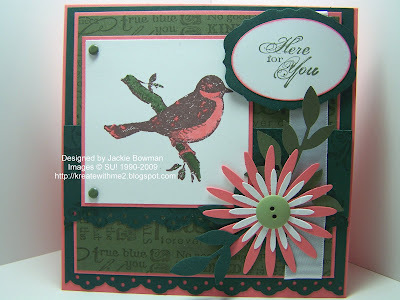 I really like the bird stamp, and the pretty flower you added to the card.